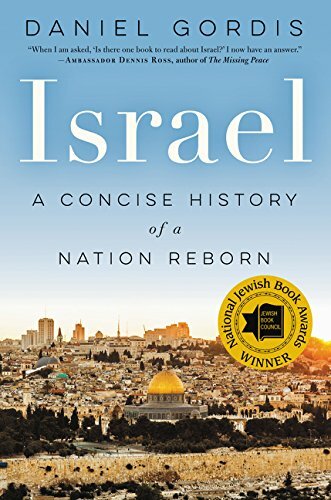 “Israel is a story of a homeless people that kept a dream alive for millennia, of a people’s redemption from the edge of the abyss, of a nation forging a future when none seemed possible,” Daniel Gordis writes in the introduction to his new book, Israel: A Concise History of a Nation Reborn. He continues, “Never had the Jews left Zion willingly, and never had they ceased believing that they would one day return.” Gordis captures the intense struggle of the Jews to secure their homeland as they suffered expulsion, pogroms, and the Holocaust. It is a story of the Jewish people and the State of Israel. It is the story of military triumphs and international opprobrium. Finally, it is the story about the political and ethical challenges of Israel as both Jewish state and democracy. As with anything related to Israel and the Middle East, this history will be seen as controversial, triumphalist, hagiographic, and pro-Zionist. Gordis seeks out to correct revisionist history yet never shies away from Israel’s more egregious acts of territorial conquest and ethnic removal. A prolific author and columnist, Gordis writes extensively on Jewish and Israeli topics. These range from Menachem Begin: The Battle for Israel’s Soul (also reviewed at New York Journal of Books) to Becoming a Jewish Parent: How to Explore Spirituality and Tradition with Your Children. Using his skills as a journalist, Gordis has fashioned a short history of Israel aimed at a general audience. He succeeds with a few concessions for length and accessibility. Despite lacking a detailed account of Israel’s economic situation, he goes to great length to integrate poetry and literature into the nation’s political and military history. In the hardcover edition, this is handled in under 500 pages. The brief history has several appendices, listing people, non-English terms, Israel’s Declaration of Independence, a list of Israel’s presidents and prime ministers, and a list for further reading. Through a riveting social and intellectual history, Israel recounts the emergence of Zionism as a mass movement. Yet Zionism never presents itself as a monolithic enterprise, instead Gordis describes Zionism as “a conversation, not an ideology.” Beneath the umbrella term “Zionism” is Theodor Herzl’s vision of a Jewish home and his leadership in the Zionist congresses. Ze’ev Jabotinsky is the founder of Revisionist Zionism, a branch of Zionism committed to creating a Jewish state through force. Anti-Zionist Jews included Haredim, ultra-Orthodox Jews who oppose the creation of Israel. Today they are a major political force within Israel, a reaction to Zionism’s initial secular outlook. The Zionist embrace of secularism was in itself a reaction to their opinion that the Jewish religion had made the Jew weak and enslaved to tradition. One of Zionism’s many projects included creating the “new Jew,” muscular, secular, and politically active. Jewish passivity during the pogrom in Kishinev, Russia. The name Kishinev runs throughout the book like a bloody refrain, the Jews enduring again and again under the attack of their enemies. No general history is without its shortcomings, particularly for a nation as troubled as Israel. The most glaring omission is the Arab population of Israel. The short length and sweeping narrative preserve a delicate balance between everyday Israeli stories and the Great Man profiles. Israel gives brief backgrounders on Yasser Arafat, Gamal Abdel Nasser, and other high-profile politicians and terrorists. Yet everyday life in the occupied territories gets reduced to “the Arab street,” an amorphous entity that erupts every time Israel provokes it. Palestinians are problematized as a thing to be solved, not as individuals. No history is perfect and no writer will ever be unbiased, but Israel: A Concise History of a Nation Reborn comes pretty close. For those interested in an introductory volume about the Jewish people and Israeli history, this book is highly recommended. Even more so, since the U.S. election may raise the specter of the anti-Semitic extreme Right in France, the Netherlands, and Austria.